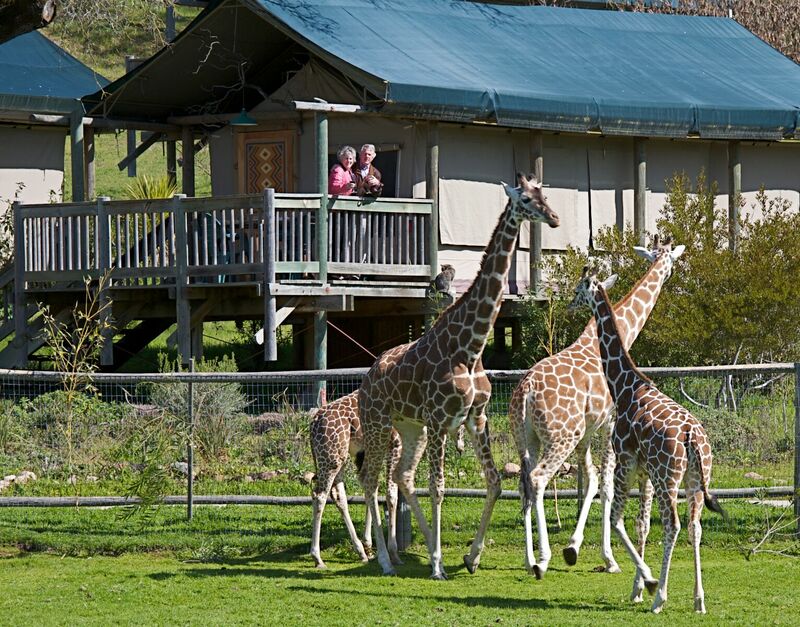 Hankering to sleep in the outdoors and connect with nature in California Wine Country? Seeking that nostalgic summer camp experience without the ants in your pants and the sand in your sleeping bag? If only we could camp out without having to load the car with supplies, haul a trailer, or pitch a tent in the middle of the night. A new way to go camping without having to rough it is called glamping, also known as luxury camping or glamorous camping. The perfect cure for workaday stress and campout envy is sleeping under canvas on a real bed on Egyptian cotton sheets in a cozy, lantern-lit tent. Roasting s’mores over a campfire, relaxing in a hot tub and limitless daytime adventures are all on the glamping menu, too. Popular around the country, glamping resorts have popped up in recent years around the California Wine Country and on the California coast. 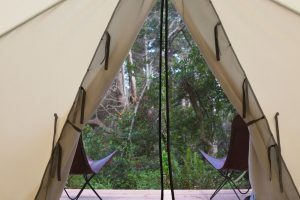 Promising the comforts of home, and many of the comforts of luxury hotels, they set up permanent tents in beautiful places, such as forests and wildlife preserves, blufftop retreats and secluded hideaways. All of these glampsites are located near hiking, biking, kayaking, animal viewing, tourist attractions and wineries. Ranch guests spend their lazy days hanging out around the huge pool and the hot tub, and wandering the extensive gardens and oak groves. After visits to Sonoma Valley wineries and hiking on the property and in Jack London State Park, optional massages and meals in the museum-like, Mission-style ranch house are inviting, too. 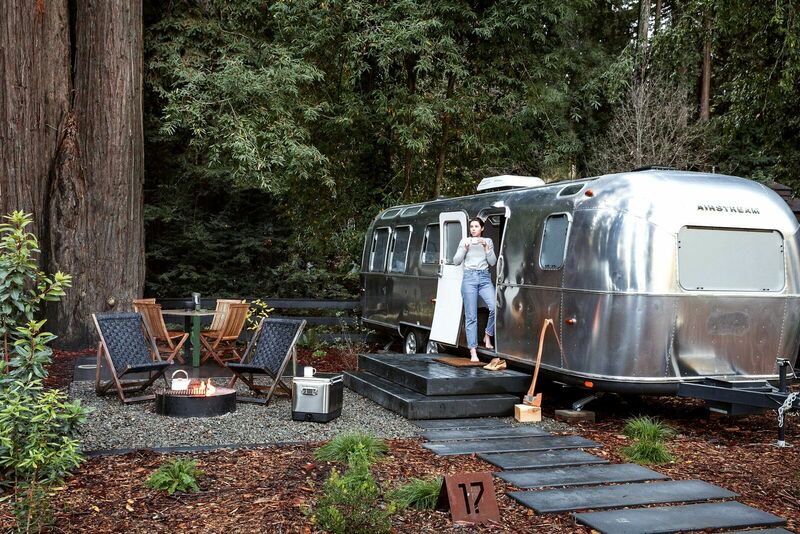 Ready To Glamp Out in California Wine Country? 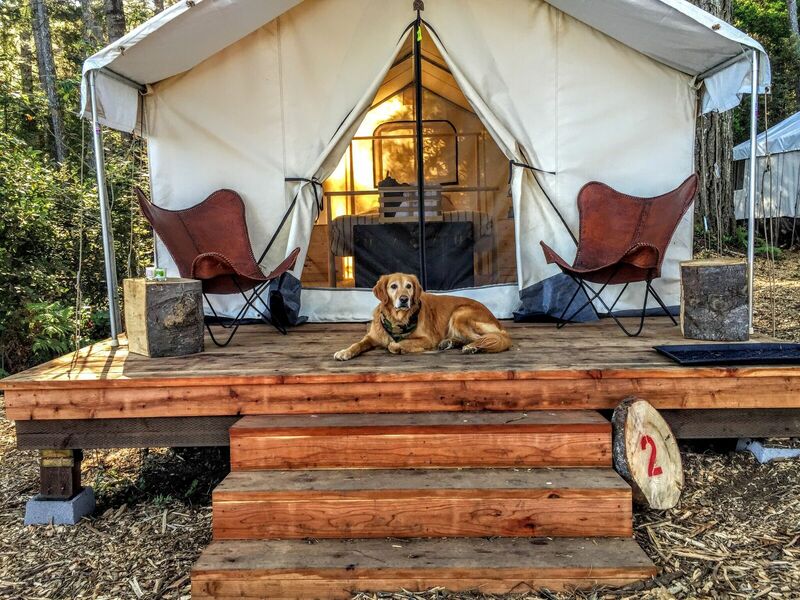 Glamping Hub: In Sonoma and Mendocino counties and around the world, tents, cabins, campervans, yurts, tree houses and more vacation rentals and glamping-style accommodations are booked on this website. Bothe Napa Valley State Park: 3801 St. Helena Highway, Calistoga; 707-942-4575. Yurts from $55 per night. Dogs allowed in some, not all, units. Ask for a yurt in the Ritchey Creek section away from the highway. Guests gather in the mid-century modern clubhouse and around indoor and outdoor fire pit lounges; the general store is stocked with local wine, beer and snacks, hot drinks and fresh fruit. You can walk from here to a riverside beach, and bike or drive five minutes into town for gallery browsing and restaurants, and to Armstrong Redwood State Park. Where did you go glamping this year? We’d love to hear about it . . .
Join the tribe – SUBSCRIBE!